• 1st- Welfare Concerns for female, CPOs attend and locate female on Kings Square, female appeared distressed. CPOs calm her down and pass over all relevant info of organisations for help (The Cavern). The female was very thankful of the help given by CPOs and sought support. • 2nd- CPOs locate vulnerable female, took to City Police Station reception. • CPOs deal with male that pretends to be injured and falls over in various stores around the city, due to the nature of his behaviour this resulted in a Yellow card being issued. • Known Beggar from Cheltenham sighted in City and spoken to on numerous occasions by CPOs & PCSOs. • 3rd- CPOs speak to known female Beggar that has come from Cheltenham, spoken to on Numerous occasions, support card issued. • 4th- CPOs stop known female shoplifter for theft in multiple stores, she was arrested as she breached exclusion notice. • 4th – CPOs assisted Store Loss Prevention by stopping 2 x females that had stolen from store, females ended up having more items on them that had been stolen from other stores. • 5th- CPOs retrieved a stolen Bike that had been taken by known offender. • CPOs retrieved items from a male that had stolen items from a Store, all items returned to store. • CPOs & PCSOs assist Store Loss Prevention with detaining known offender that had previous offence in Store. Male was later arrested for offence, breach of CBO & store ban. • 6th- CPOs stopped known offender that had breached bail conditions not to enter City Safe Premises and City Centre. • 6th – CPOs assist store with offender that selected and de-tagged several fragrances, Yellow Card issued, Police attend store. • 6th – CPOs assist PCSO as known female offender attempted theft in store, female was issued Yellow card and removed from City Centre. • 6th – CPOs identify known offender in new store in Gloucester. • 8th – CPOs stopped a known offender that had stolen items of Clothing from Store in KingsWalk Centre, all items retrieved male removed from City Centre. • 8th – CPOs conduct welfare visits to City Safe members. 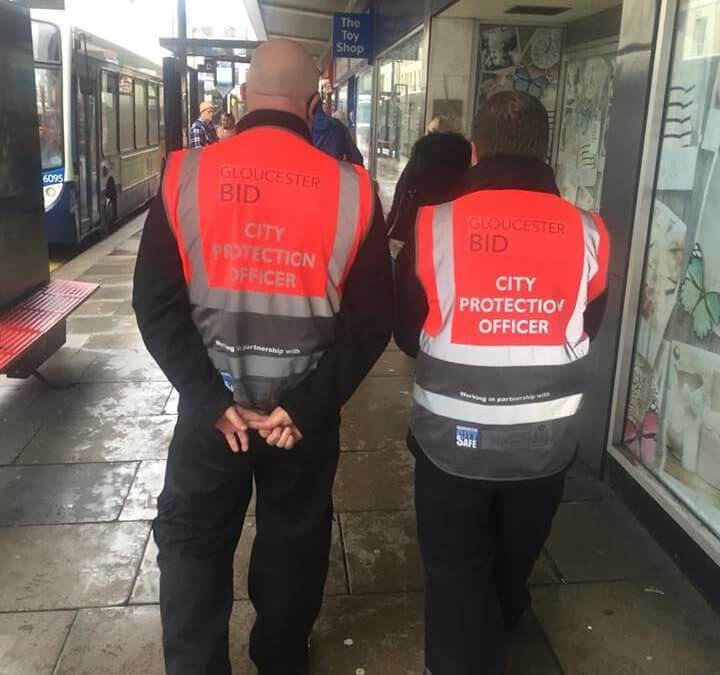 • 9th- CPOs spoke with several beggars in the City Centre, welfare checks carried out and all information and leaflets passed to those in need. • 9th – CPOs attend first Aid Incident with member of public outside KingsWalk, CPOs remain with the elderly lady that had a fall and may have injured hip. Remained by her side until Paramedics arrive. • CPOs stop large group of youths that were on roofing areas above Sports Direct and surrounding buildings, this led to 3 x bikes being confiscated, Yellow cards issued, and parents notified. • 10th- CPOs attend and assist B&M Staff with known offender that has been targeting both Gloucester branches, male was detained for theft of electrical’s, all items retrieved male leaves City Centre. • 11th- CPOs attend local premised due to concerns for female as she appeared to be having some issues with possible domestic violence. She was later taken away by Police Officers and given support. • 11th – CPOs assist male that was very intoxicated and help him get home safely. • 11th – CPOs attend first aid incident outside WH-Smith, male had tripped and banged his head, CPOs stayed with Male until Paramedics arrive. • 12th- CPOs engage with new face on the Gate Streets, all information given regarding safe haven and where to go for food and support. • 12th – CPOs assist Staff at KingsWalk with First Aid incident around the Centre. • 12th – CPOs attend Store on Eastgate Street and separate two males that were having altercation in and around store. • 13th- CPOs conduct welfare checks on City Safe members, checking all Radios and City Safe internet applications. • 13th – CPOs assist 2 x female carers that were having difficulties with their male client, who is agitated and upset. CPOs calmed male down until Police arrived for support and to get male home safely. • 13th – CPOs attend College Street and dispersed a large group of Youths causing ASB in the area. • 14th- CPOs attend Store and assist staff with 2 x female offenders, both were issued Yellow card warnings and sent on their way, all items returned. • 14th – CPOs stop male who was wanted by Police, detained until Police arrived. • 15th- CPOs visit Store to review CCTV and identify offenders that have been targeting stores daily. • 15th – CPOs attend public house and deal with aggressive drunken male, male was removed from area. • 15th – CPOs assist PCSO with male that was wanted by Police. • 16th – CPOs deal with large group of Youths causing ASB issues on Westgate Street. • 17th – CPOs detain wanted male on College Street, male was taken into Police Custody. • 18th- CPOs detain male for Shoplifting from Store, male became aggressive CPOs used reasonable force, male later arrested. • 18th – CPOs identify known offender after reviewing CCTV in store that was targeted the previous day. • 19th – CPOs assist Known male that was very intoxicated, the male ended up needing First Aid, Paramedics called and attended. • 20th – CPOs speak to all known Beggars in City. • 20th – CPOs attend premises to speak to Staff in relation to an altercation that occurred earlier on, Incident reported and crimed. • 21st- CPOs detain known female offender for Theft of Cosmetics in Store, Female was then removed from store and advised to leave City Centre. • 21st – CPOs conduct visible presence in Store as reports of mental health patient may arrive at store in order to obtain a knife, individual did not arrive so no issues. • 22nd – CPOs attend Store on Eastgate Street as reports of an altercation with 2 x males, CPOs resolve the situation until Police arrive. • 22nd – CPOs visit Cavern and engage with all members. • 23rd – CPOs carry out patrol of a Store and whilst in store spot well known offender selecting items. Male was stopped and all items were handed to CPOs and male removed from store, male had taken items from another store CPOs return items to store. • 23rd – CPOs detain known offender for breaching Criminal Behaviour order and was also wanted by Loss Prevention for theft of Jackets previous, male was arrested. • 23rd – CPOs attend Store as 2 x females detained for large bulk theft, £400 in value. All details obtained added to City Safe and issued Yellow cards. • 24th – CPOs visit store to review CCTV and identified known offender. • 24th – CPOs & PCSO closely monitor known Shoplifter, male entered City Safe members store, was then stopped and all bags checked and then removed from area. • 25th – CPOs attend Store after receiving a call that a known male is in store and is very intoxicated, CPOs resolve issue with male and Police attend, Male is removed from premises. • 26TH – CPOs receive call for assistance from Store security, male had got away with bottle of wine. CPOs located male in Greyfriars area and retrieved item, male was issued yellow card and removed from area. • 27th – CPOs detain wanted male offender, male was then handed over to Police after being wanted for numerous incidents. • 27th – CPOs assist Stores detaining well known female offender for theft of fragrances, all items retrieved female was removed from City Centre. • 29th – CPOs remove known female offender from Store as previous day she tried to shoplift. • 29th – CPOs receive radio call from Store asking for assistance as Male in store being aggressive. CPOs knew male and calmed him down and Police officers attend, male was removed from area. • 30th – CPOs attend Supermarket to identify shoplifter, who was stopped by Security for theft of headphones, male was known to CPO’s.• CPOs assist Store in stopping 2 x females that had stolen £300.00 worth of fragrances from store, females were from out of Country both were arrested.